Your love for seafood might pass onto your kitty, and he may stare greedily at a plate of crab curry or sticks lying on the dinner table. Well, giving them crab meat in moderation would do no harm, keeping in mind the host of nutritional benefits it contains. There is lack of sufficient evidence regarding the impact of crab meat on felines, though no adverse incidences have been reported as such. Being high in protein, carbohydrates, and Omega 3 fatty acids, crab meat would be one of the excellent meat sources for the cat’s overall health. 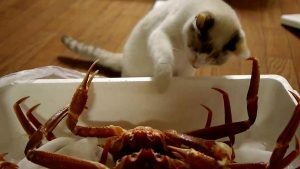 Vitamin B12 is also present in crabs, particularly in its flesh or meat, in abundance is essential in cats for maintaining their immunity, as well as boosting their digestive health and nervous system. Note: Avoid giving them imitation crab as they are processed and contain a whole lot of artificial colorings that might not be healthy enough for cats. Though there are no known side effects, eating crabs in excess amounts may lead to stomach problems. Your cat might also be allergic to crabs, showing symptoms like sneezing and itchiness. Monitor your cat carefully and contact a veterinarian in such cases.